If you work with currency/sales data, it comes in handy to know how to insert dollar and cent symbols with the numerical/sales values in Excel. While the dollar sign is right there on the keyboard, cent symbol is a little more difficult to find and insert. 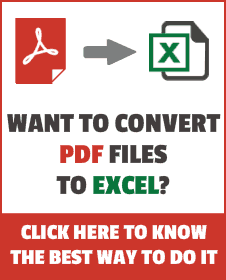 The keyboard shortcut to insert the cent symbol in Excel is ALT + 0162. You need to hold the ALT key and then press 0162 on the number keypad of your keyboard. As soon as you this and leave the ALT key, you see that the cent symbol has been inserted. You can use the Excel CHAR function to insert the cent symbol in a cell in Excel. To do this, enter =CHAR(162) in a cell and press enter. It will automatically return the cent symbol as the result. You can also use this formula with other text strings or formulas to add the cent symbol to it. For example, if you want to have 10¢ in a cell, you can use the formula =10&CHAR(162). 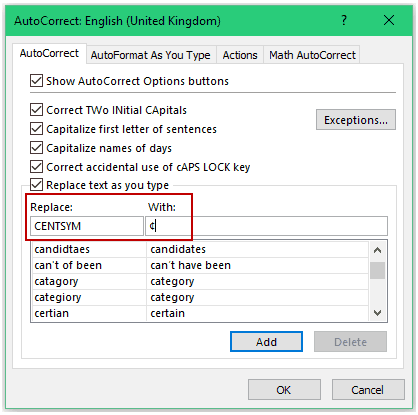 Excel autocorrect feature enables you to assign a text code to the cent symbol (let’s say CENTSYM). Now whenever you enter this code CENTSYM in any cell in Excel, it will automatically convert it into the cent symbol. In the Options dialogue box, select Proofing –> Autocorrect Options..
With: ¢ (you can get the cent symbol by using the shortcut ALT 0162, the =CHAR(162) function, or simply copy paste it from this tutorial). That’s it! Now, whenever you type the text CENTSYM, it will automatically get converted into the cent symbol. Autocorrect feature is case sensitive. Hence, if you enter centsym, it will not get converted to the Cent symbol. You need to enter CENTSYM for this to work. This change also gets applied to all the other Microsoft applications (word, powerpoint, etc.). So be cautious and choose the keyword that you are highly unlikely to use in any other application. So, these are the three methods you can use to type the Cent symbol in Excel. If you come across any other method, do share it with me in the comments section. How did you like this tutorial? Let me know your thoughts by leaving a comment below. Insert Delta Symbol in Excel.